275 East 131st Street - Cleveland, Ohio 44108 U.S.A.
Machine is Reconditioned in Good Working Order. Heavy duty construction with an all welded steel base. Four (4) directional air flow (2 sides, top and bottom) with variable velocity control. Locking casters and adjustable leveling feet. Variable speed conveyor with high temp. silicone covered rollers. Sealed roller bearings on conveyor drive and idler shifts. Solid state digital temperature controller. 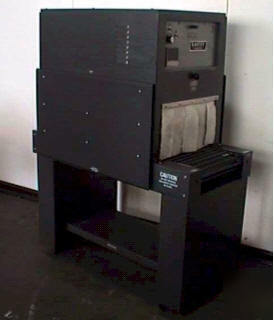 Three (3) heater banks – 7.5 KW total. Heater bank ON – OFF switch. VOLTAGE: 220 Volt AC / Single Phase / 35 Amp. MACHINE DIMENSIONS: 49” long x 24” wide x 64” high. STANDARD SPEED: 15 packages per minute (based on average size packages).